Kandy Sports Club’s Jeewa Galgamuwa sends out a pass olthough he is tacled by a CR and FC player . also in the picture is CR and FC’s Ashen Karthelis in the Caltex Clifford Cup final played at Nittawela yesterday. 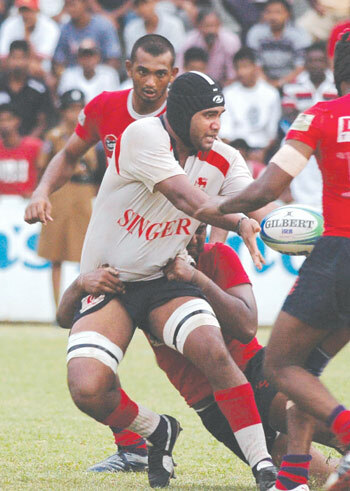 Kandy Sports Club not only regained the Caltex Clifford Cup but also completed the rugby double when they scored a rousing 16 points (2 tries, 1 penalty, 1 drop goal) to 5 (1 try) win over CR and FC in the finals of the Clifford Cup rugby tournament match played before a large crowd at Nittawela yesterday. At half time scores stood deadlocked at 5 all. The playmaker, Jonnie Wilkinson of Sri Lankan rugby Nalaka Weerakoddy of Kandy Sports Club hanged up his boots after yesterday's grand final of the Clifford Cup at his home ground in Nittawela. He ended his club rugby career spanning over 10 years. It should be a gruelling battle for supremacy when thrice runner up Rajeev Rajapakse will take on Amrith Rupasinghe to decide who will win the national title at the 92nd National Tennis final that will take place today at 1.30 p.m. at the SLTA Courts Greenpath, Colombo.